Senior Telugu writer to direct Rajinikanth? According to the latest reports, senior writer turned filmmaker, Vijayendra Prasad, is in talks with Superstar Rajinikanth for an upcoming film which he will be reportedly directing. 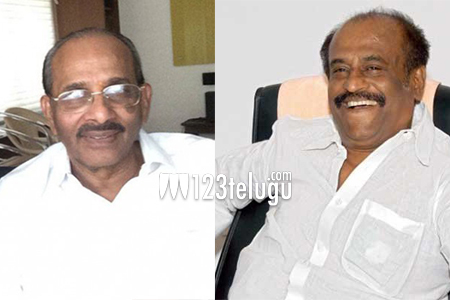 Apparently, Rajinikanth and Vijayendra Prasad met in a recent function and discussed about a possible film together. The reports further say that the senior writer narrated a story with a political backdrop and Rajini is said to have given his nod readily. The film may commence soon after Rajini finishes Robo 2 with Shankar in 2016. Vijayendra Prasad is on a roll with the back to back successes of Baahubali and Bajarangi Bhaijaan. Earlier, the star writer said that he narrated Bajarangi Bhaijaan’s story to Rajinikanth.